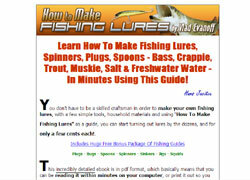 How To Make Fishing Lures - This classic fishing reference book, written by Vlad Evanoff, will teach you everything you ever wanted to know about how to make your own lures. Benefit from the tips and tricks learnt over a life time of lure making experience by one of the most creative anglers in this exciting sport. Arranged in 13 information packed chapters you'll get the authors life time fishing lure making experience distilled in incredible detail as he gives the inside scope on: -Tools -Fresh water Plugs -Fresh water Spin Bugs -Salt Water Plugs -Spoons -Spinners -Jigs -Metal squids -Eel and Eelskin Lures -More Lures -Sinkers -Leaders and Connections -Care and Repair Of Fishing Lures And much more.